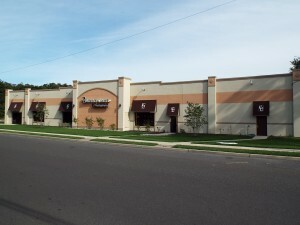 Wolf Commercial Real Estate, a well-respected Berlin commercial real estate brokerage firm that specializes in Berlin commercial real estate listings and services, has a nicely situated tract of Berlin industrial space for sale or lease at 110 Cushman Avenue West Berlin NJ. This Berlin industrial building for sale or lease has right around 35,500 square feet of Berlin industrial and flex space for sale or lease. This Berlin industrial space for sale is worth serious consideration by both investors and owner-occupants. There are about 18,562 square feet of Berlin warehouse space for sale or lease at this industrial space in Berlin. Another 8,006 square feet of this Berlin industrial space for sale or lease can hold a showroom. This Berlin industrial building for sale or lease also features about 8,932 square feet of Berlin office space for sale or lease. The asking sale price for this Berlin industrial and flex space for sale or lease at 110 Cushman Avenue West Berlin NJ is $2,350,000. The asking lease price for this industrial space in Berlin is $9.00/sf NNN. This Berlin industrial space for sale or lease can be purchased or rented from Wolf Commercial Real Estate, a Berlin commercial real estate broker that works tirelessly on Berlin commercial real estate listings and services. Building improvements recently were undertaken and completed at this Berlin industrial space for sale or lease that also can serve as a Berlin office space for sale or lease. This Berlin industrial and flex space for sale at 110 Cushman Avenue West Berlin NJ comes with four drive-ins and 18-foot ceilings. About 16,000 square feet of this industrial space in Berlin is served by the HVAC system and this Berlin industrial building for sale or lease has 25 convenient parking spaces. This Berlin industrial space for sale or lease is in a Regional Commercial Growth Zone (C-3 RGA ZONE). You’ll also find facade signage at this Berlin industrial building for sale or lease through Wolf Commercial Real Estate, a Berlin commercial real estate brokerage firm that has a a great deal of experience in Berlin commercial real estate listings and services. This Berlin warehouse space for sale or lease sits on about eight acres very close to Route 73 and you can quickly get to and from Route 30 from this Berlin office space for sale or lease. This Berlin warehouse space for sale or lease also is near Atlantic City Expressway and Cooper Road. When you are within a five-mile radius of this Berlin industrial and flex space for sale at 110 Cushman Avenue West Berlin NJ, you will find in excess of 101,000 people. Residents near this Berlin industrial space for sale or lease have an average household income of nearly $90,000. For more information about this Berlin industrial space for sale lease at 110 Cushman Avenue West Berlin NJ or about any other Berlin commercial properties for sale or lease, please contact Christopher Henderson (856-857-6337; chris.henderson@wolfcre.com) or Scott Seligman (856-857-6305; scott.seligman@wolfcre.com) at Wolf Commercial Real Estate, a Berlin commercial real estate broker. Wolf Commercial Real Estate is a premier Berlin commercial real estate broker that provides a full range of Berlin commercial real estate listings and services, marketing commercial offices, medical properties, industrial properties, land properties, retail buildings and other Berlin commercial properties for buyers, tenants, investors and sellers. Please visit our websites for a full listing of Berlin commercial properties for lease or sale through the team at our Berlin commercial real estate brokerage firm.